In a few days I am getting ready to put on an exhibition of fine art prints and annotated maps at Chennai’s DakshinaChitra gallery. The show is entitled The Hills of Murugan: Landscape, Ecology & Change in the Palani Hills and will be open to visitors from July 6th-30th. The exhibition is a compilation of nearly 30 years of documentation and 48 years of experience exploring in the Palani Hills (see list of related publications below). My past exhibitions in India focused on the broader range of the southern Western Ghats and this is a more narrowly focused series of images that emphasize one range. 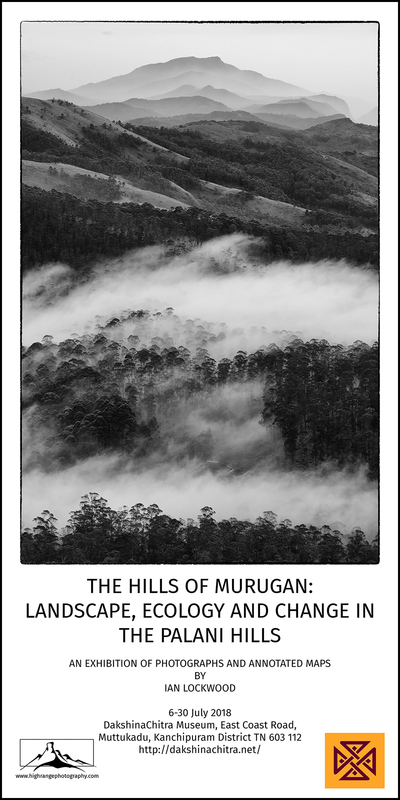 In the Hills of Murugan I highlight themes of changing landscape and vegetation patterns in the Palani Hills as seen in photographs and satellite imagery. Seasoned readers of this blog know that these are ideas that I have explored in published articles, exhibitions and posts on my blog. My work attempts to bridge science with art and conservation and I am mindful that it should not be confused with picturesque approaches to beautiful locations in India. Samples of the 20″x 20″ prints fresh from Karthik’s printer and just signed. These are printed on Canson Infinity Rag Photographique 310 GSM, the leading papers for monochrome printing. They will be part of the main gallery of roughly 30 black & white fine art prints in square, rectangular and panoramic format. Karthik inspecting an image and setting profiles for the printer. Amy and Raina inspect the results. Frame tests of a 20″x20″ print (without captions and signature lines) at Focus Gallery in Chennaii. The upcoming show marks an important step forward with my photographic printing. For the last 15 years I have been struggling with how best to print and share my work. For the Drik and IIC exhibitions in 2000-02 I showed work that I had completed in a traditional wet darkroom. Even though I was using medium format film that produced detailed black & white negatives, the print size was limited by the availability of photographic paper (carried from the US in luggage) and the tray sizes. My largest prints were 16”x 20” and most were 10”x 10”. With the digital revolution and the advent of digital printing my darkroom was mothballed and I tinkered with learning new skills to make black & white prints. Printing has been straight forward in Colombo’s commercial labs but the paper quality was not up to my old darkroom standards where I employed fiber-based archival paper. It has been easier to communicate my photographic work on electronic media-my blog, website and in occasional published articles. However, I’m still a believer in the idea that the photographic fine art print is the ultimate expression of the process. For the Hills of Murugan show I was able to make contact with V. Karthik, India’s leading fine art printer. As someone with a long record of working in photographic the industry and specializing in archival restoration and printing, Karthik has developed a refined knowledge and work flow with printing fine art photographic prints. He knows the different papers, the printers and has a special appreciation for black & white work. Two weeks ago I met Karthik and we worked together with my files. Based on his guidance I had 32 different images printed that will be on display at the exhibition. Family friend, Indian snake man and Padma Shri awardee Rom Whitaker will be inaugurating the show on July 6th at 4:30. Rom was a natural choice-he grew up in the Palanis and did some his early snake catching there. His years at Kodai school in the 1950s overlapped with my parents, Merrick and Sara Ann. My uncle, Charles Emerson, was Rom’s roommate when he was keeping snakes under his dormitory bed and I have strong memories of outings with Rom to go fishing and looking for snakes during m school years in the 1980s. DakshinaChitra is on the same East Coast road as the Croc Bank, the site that was a key part of Rom’s work with reptiles. The team at DakshinaChitra, with guidance from curator Gita and support from Sharat Nambiar and Debbie Thiagarajan has helped facilitate the show after I proposed the idea in January. I had an affiliation with DakshinaChitra through my uncle Dr. Michael Lockwood who has contributed antique brass pieces to the galleries. I have gained a new appreciation for DakshinaChitra’s vital role in preserving and sustaining key aspects of south India’s rich cultural heritage. The Hills of Murugan has an ecological rather than cultural focus. However, through the choice of images one can better understand that the landscape and ecology provide a foundation for the livelihoods of the people living in the Palani Hills. My wife Raina and children Lenny and Amy are putting up with me during this busy time and providing advice on the images and how best to arrange things. The main exhibition is composed of 32 black & white fine art prints. These framed prints are designed to be a body of work that stand alone but that illustrate the themes of landscape, ecology and change in the Palani Hills. In DakshinaChitra’s side gallery I have compiled a series of annotated posters, maps and mini posters highlighting key species from the Palani Hills landscape. The goal here is more ambitious: it is designed to be educational, such that visitors come away with a better sense of the area’s biodiversity, ecology and hydrology. Through annotated maps and posters I make references to recent history and ecological change. The theme of ecological changes resulting from non-native plantation efforts are presented and there are suggestions on the important work that needs to be done to protect the Palani Hills in the future. The Hills of Murugan opens on July 6th at 4:30 and the show is open until the 30th of July (Tuesdays are holidays). I hope to see you there! Palani Hills selection of shola/grasslands species. These are printed as A2 posters to accompany information posters in an adjoining room next to the main gallery. For the exhibition I produced a series of new maps to accompany the information side of the presentation. 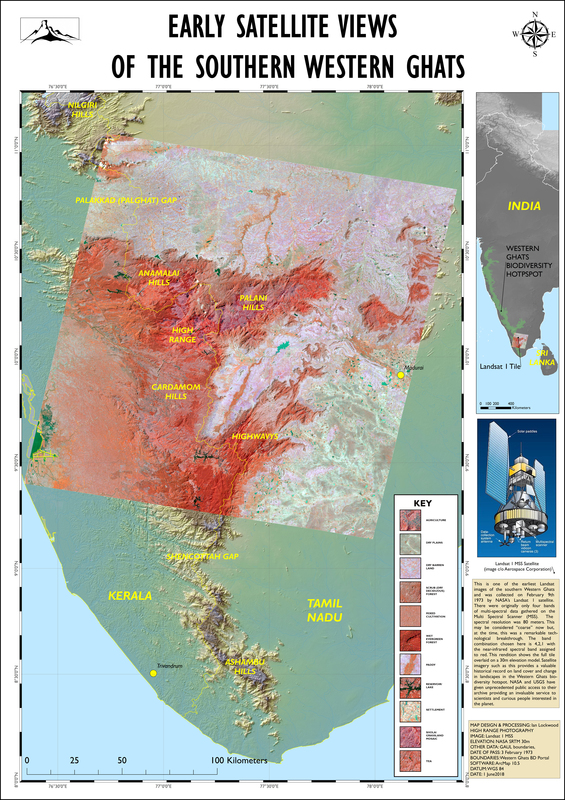 This is a map depicting the earliest Landsat image of the Palani HIlls area. It is printed as an A1 size poster that will be in a smaller gallery next to the main hall of fine art prints. The elevation map is based on a digital elevation model of 30 meter data that I have processed from NASA raw data. 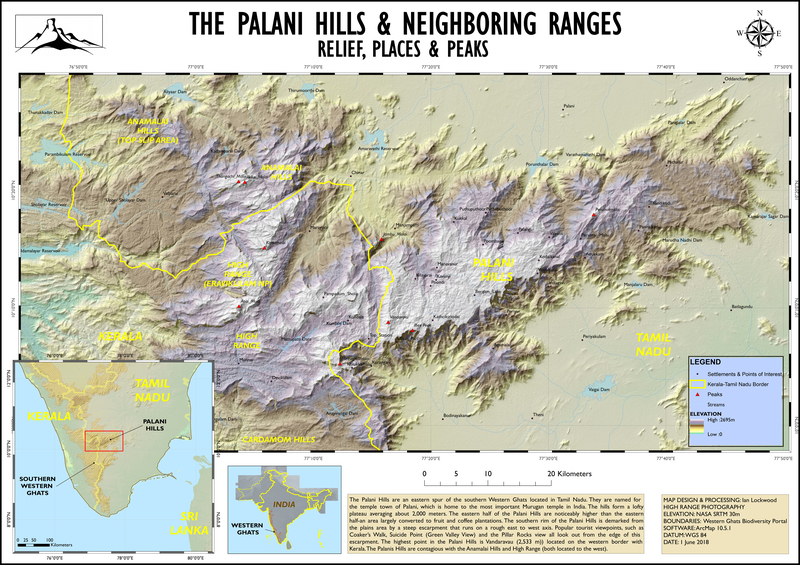 I have also added key points and settlements but have left out roads and other human impacts so as to emphasize the topographical features of the Palani Hills landscape. Arsumani, M. et al. “Not seeing the grass for the trees: Timber plantations and agriculture shrink tropical montane grassland by two-thirds over four decades in the Palani Hills, a Western Ghats Sky Island. PLOS One. January 2018. Web. Well done. I really enjoyed this read.